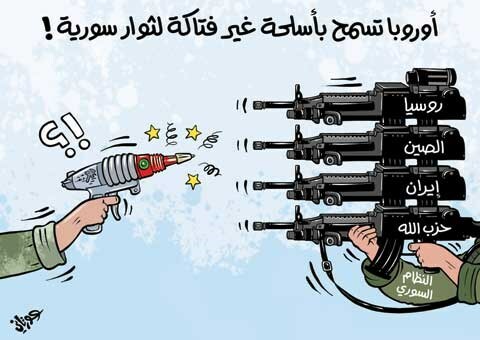 "America & Europe to provide the Syrian rebels with non-lethal armor". The Washington Post published an article last week on the promise of the Obama administration to supply the rebel forces in Syria with soft aid. Later, the Syrian opposition replied saying they need guns, not bandages. The unsuspecting reader would think that here is a conversation between the tactically cautious 1st world and the trigger-happy 3rd world, but far from it. Indeed, the American administration is being careful, with its declarations, with its diplomacy, with its commitments printed black on newspaper. And yes, the rebels are in need of whichever apparatus that would give them the upper hand in the fight. But this is not the first dance for these two partners, and though they have not put arms around each other, they have been going around in circles, around one another for a while now. While no confirmation of a direct US intervention in the conflict in Syria, American boots, or more correctly slick black polished shoes, have hit the ground in Syria from day one. Several mentions of this have hit the world press in the past, though mostly referred to as advisors, and on occasion even as spies. Needless to say, no gun shipment of any sort, nor any training teams introduced to the arena by interested actors have gone in without the direct or indirect approval coming through the diplomatic back channels of the world’s leading hegemon and its allies. Guns, medicine, financial aid, military advisors, and political pressures on the surrounding countries, have been working their way in and around the rebels, as much as it had with the regime forces getting it from the opposing side. Just last week another article was published on how the Saudis are supplying the rebels with Croatian weapons. Turkey has been supplying the rebels, as well as supporting them, and having an open border policy with the Syrian refugees going out and Al Qaeda fighters going in. Kurdish-Iraq has been enabling the Kurdish resistance fighters in attacking the Assad regime forces from the north east. None of this could go on without the stamp of the bald eagle. So why come out with this declaration all of a sudden? Why does the world need to hear from Secretary Kerry that the US pledges 60mil $, and possibly defensive military paraphernalia, to the Syrian opposition? Is this just for the benefit of the other countries in the conference on Syria in Rome? And why only money and defensive measures? The Syrian opposition needs serious weaponry. They need tanks, jet fighters, armor piercing shells, smart missiles, long-range cannons, and that’s just to thwart the Assad forces attacks. To take down Bashar Al-Assad himself they’ll need explosives, special ops equipment, surveillance equipment, a lot of training, and basically everything you saw on a “Mission Impossible” movie. The US administration cannot afford to give those to the rebels, or have them get it from any of its allies. The US knows that supplying the rebels with anything more than defensive equipment is to put dangerous weapons in the hands of Al-Qaeda organizations such as Jabhat Al-Nusra, aid that will come back to haunt exactly like it did with the Taliban in Afghanistan. The US knows that those weapons can get to the Kurdish resistance, which eventually, when it’s finished with the Syrian front, will turn to its Turkish front, and those weapons would be put to use against that NATO alliance partner. The US knows that if the Syrian opposition has so much military power, it might reconsider sitting down to the negotiation table, and decide to continue with targeting the rest of the Alawites in Syria, the governing echelon which comprise about 12 per cent of the Syrian population. Such ethnic cleansing will create an even bigger refugee crisis in the region than there already is, and would probably send the Druze and Shiite population in Syria running for the hills themselves. That’s why the US is going to send the Syrians Kevlar instead of C4. "Eaurope permits non-lethal weapons for the Syrian rebels"
on the right, top to bottom: Russia, China, Iran, Hizballah, Syrian regime. Taking down Assad could mean a complete and utter chaos. Doing so with the direct military assistance of the US would just facilitate that more quickly. One has just to look towards Iraq and Libya to realize that the Arab nations are better off sorting out their own mess. But that’s not to say that an indirect American involvement could not help prevent the tribal war that follows the fall of an Arab tyrant. The old Arab saying “Sixty years of tyranny are better than one night of Fitna (civil strife)” is why these regimes have held on for so long, and it is going to take gentle diplomacy to try and prevent the day from turning into that night, while not letting unwanted forces rise to the top. The US declared involvement in Syria marks a new era in this conflict, but it is merely a precursor. The powers to be want to prevent any prolonging of the conflict, but also to avoid any genocide in the aftermath. The newly announced US commitment is not a declaration of war on the Syrian ruler. No, that already happened a long time ago, when the Obama administration made it very clear that Bashar Al-Assad is a persona non grata. But rather it is the start of bargaining with the Syrian opposition on the form and shape of Syria of the day after, and with the interested parties that are pushing for a more forceful approach, i.e. Qatar. My distinguished professor for American involvement in the Middle East use to say on every occasion “America’s business is business”. The US is looking for calm in the Middle East, and for preserving its economic interest in the region, and for that the Obama administration is willing to go through great lengths, and deliver large sums. To obtain those objectives the US is willing to publicly back the Syrian opposition and to rally the rest of the western world behind it, but only as long as the rebels, and their supporters in the gulf, adhere to the guidelines: An end to violence in Syria, live and let live. Violence is bad for business. The US could promote the easiest way out for the Assad regime – a separate Alawite nation within Syria, much like the Kurdish one in Iraq. Negotiations have already started and the Syrian regime has already agreed to talk, as Syria’s foreign minister Walid Mualem stated in January. Sadly, for the opposition that would be considered as an egg not easily wiped off their faces. To allow Bashar Al-Assad to go scot-free, and to have him establish a new land in a prominent area of Syria – the coastal strip on the Mediterranean, is a notion the opposition cannot stand for and would never consider as a just resolve. On the other hand, the Syrian regime will not just step down, without ensuring the survival of its people and their prosperity. That’s why the US is promoting the idea that the opposition deserves justice, and is entitled to support. Not because the opposition needs a commitment of assistance, they are already getting it, and with the latest diplomatic caving of the regime to talk, the rebels are just a few yards away from achieving a touchdown. The money is an installment, an advance on a lifetime support and guaranty, and it is there so that the opposition would agree to such an ending, one that would allow the Alawites to continue their lives in Syria, which may seem as a defeat in the rebels’ eyes. The US wants to deliver justice to the Syrian rebels. Justice in terms of aid, in terms of support, in terms of money. And justice needs to be seen, and so it did this weekend. Secretary Kerry was saying that the rebels will get 60mil $ in support, but what was to be read between the lines is that the US government is telling the opposition to take the deal they have been refusing, and that the west will pay for their swallowed pride, and will be in their debt for a very long time in the future.